I like to warn people when hyperbole is coming. Warning. Yes, this is one of the most beautiful loops that you could hope to ride. 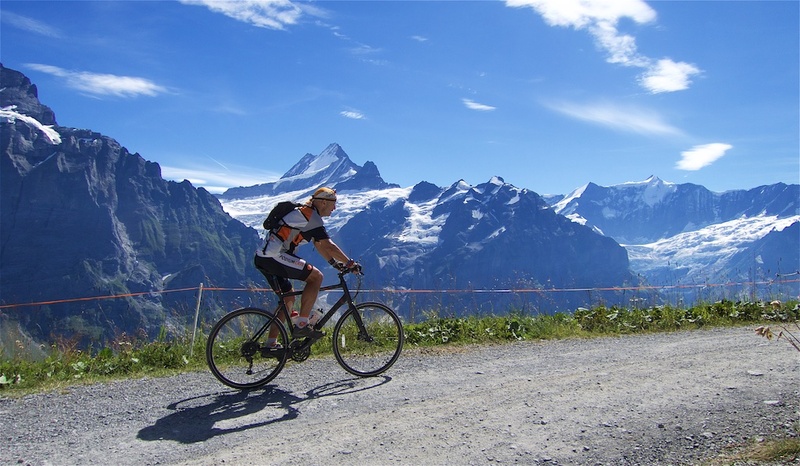 It includes the paved road to Grosse Scheidegg – one of the greatest climbs in Switzerland. 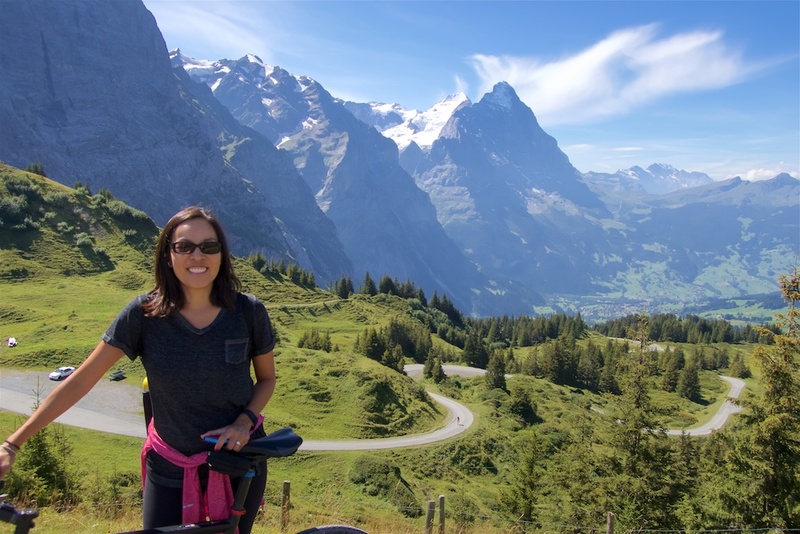 Yet, this is not even the highlight of this fabulous ride that goes much higher with constant views of the high Alps of central Switzerland. Oh, and there are lots of cows! 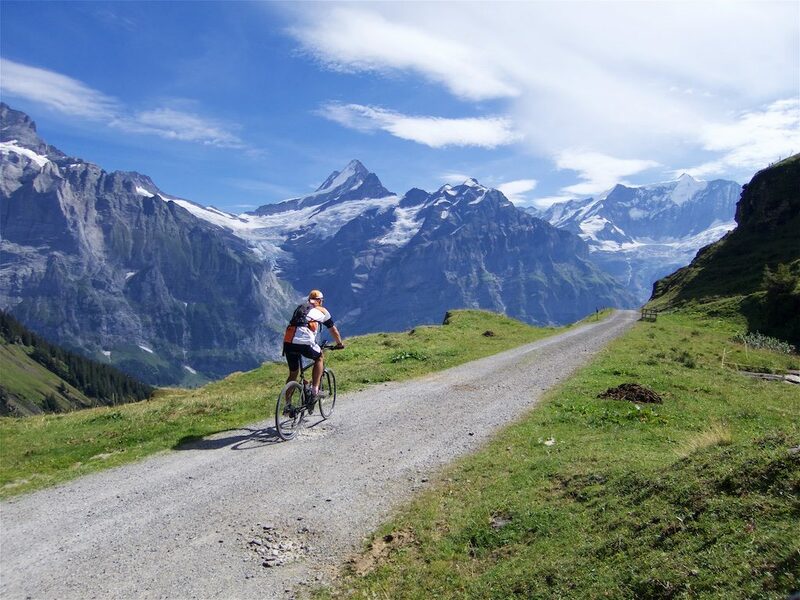 Note, I used a hybrid which was perfect for the good quality gravel for most of the route after Grosse Scheidegg (plus some trails up high). I started in Grindelwald. A couple of kilometres above the village there is parking for hikers and the road becomes a narrow, well-paved, single lane that is closed to cars – nice. But note, locals and some tourists ignore the ban, and official bus service is frequent. So while this lovely road is quiet, it is not deserted. Every 15 minutes or so I’d here the musical horn of a bus warning riders to be careful. 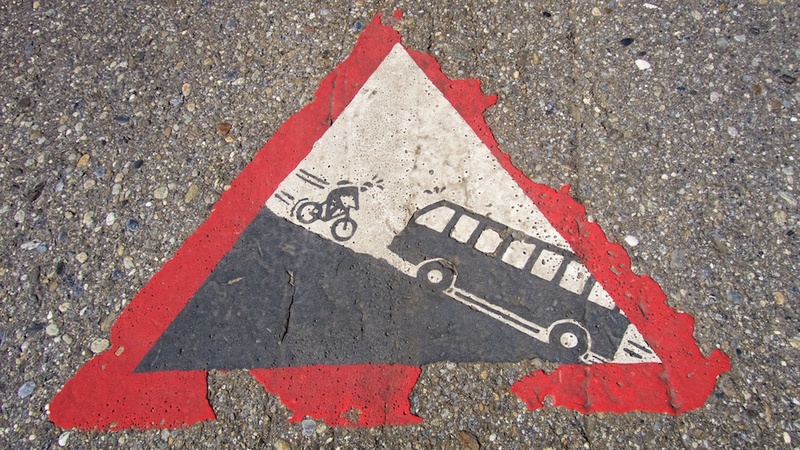 Judging by the warning painted on the road …. there have been some incidents. The sun was behind the big peaks so it was tough to take photos here, but this is paradise on a bike. 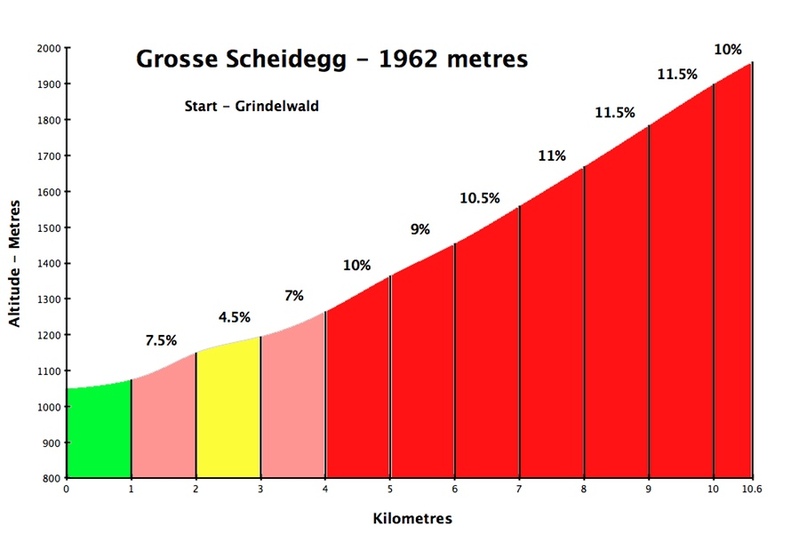 For details of the even tougher (also paved) far side of Grosse Scheidegg from Meiringen see here. From Grosse Scheidegg we left the paved road, had some lunch, and briefly hiked together on the ridge road that leads to First (2167m). I then continued on by bike towards First. 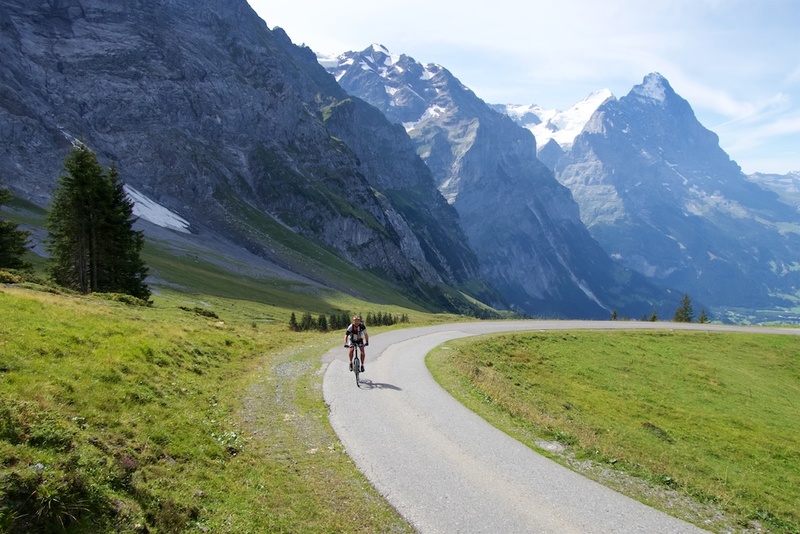 While only a couple of hundreds of metres above Grosse Scheidegg, this superb stretch goes down and up a few times and is occasionally hyper steep. But a good quality surface. First is the top of a ski lift that operates in summer and is very popular with hikers of all levels as the walk to Bachalpsee is not too challenging. The last time I was here bikers were forbidden beyond First. But now it is a signed mountain bike route to Bachalpsee. Woohoooo! Some of this route is separate from hikers, but much shares the path. So one just needs to be polite and patient. No worries. 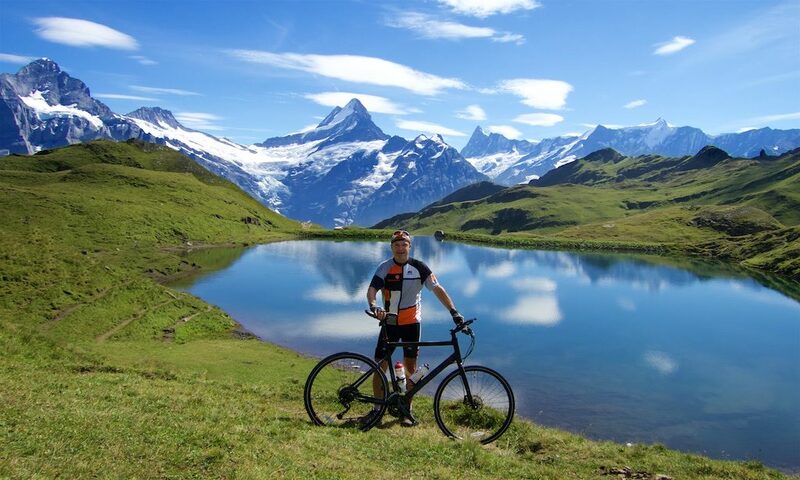 At the lake, was a mountain bike sign to Grindelwald allowing an alternate way down. This goes through an undeveloped high valley on a trail that is generally ride-able, occasionally tricky, but never dangerous. Here the route becomes quiet again. Just me and the cows. At Bachläger (1983 metres) I reached a gravel road. 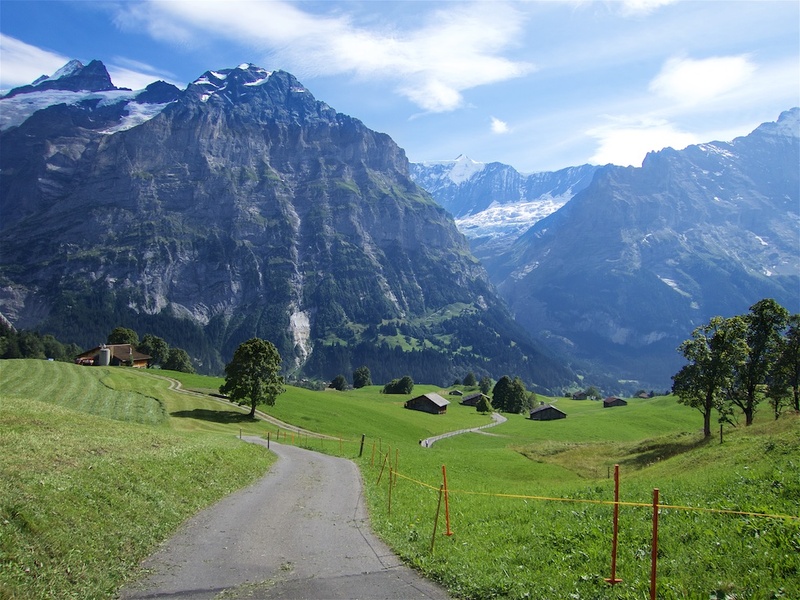 Here the route heads towards the Eiger, then down through some woods. Again, virtually deserted. Fabulous. Following the road, it eventually become paved again just below Bort (a ski lift station on the way up to First). Narrow, paved, smooth, Swiss perfect. 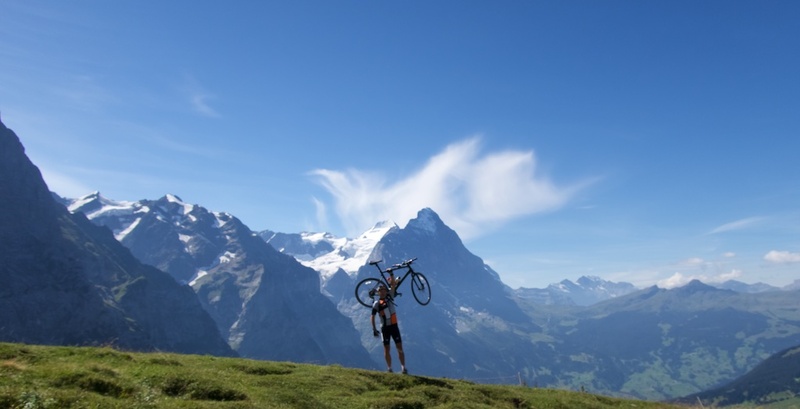 I’d ridden to Grosse Scheidegg and First previously so I knew this would be fun. But I was so excited when I learned that bikes were now permitted to Bachalpsee and that there was a superb alternate way down. I can’t recommend this route, and this region enough. For more great rides (some paved, some mtb) in the Berner Oberland and nearby see here. Beautiful! What a great blog. How did you do the fantastic 3D route view? Hi Tom, The 3D videos are made by Relive.cc. If you have a Strava account and register the account with them, they email a link to the video a few hours after any ride is uploaded to Strava. 1. I’ve been to First for several times by cable car and didn’t know I can ride up to there. I would try it next time as I agree it is one of the most beautiful in Alps (although I’ve only been to Alps for less than 10 times). 2. I also have the same hybrid bike (BMC AC02) but with reverse stem. 3. 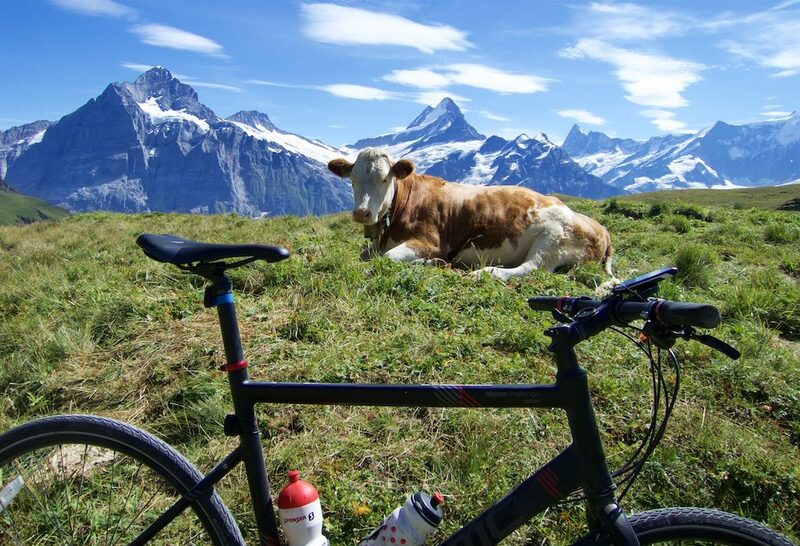 Does anyone know any cycle route in Alps region comparable to this? What I really enjoy is silent little path like this with very few traffic and not much artificial buildings around. 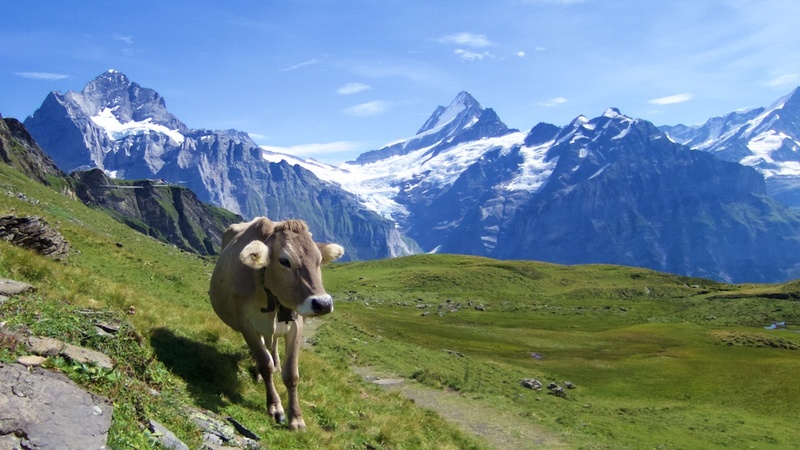 Just mountains, small lakes and cows. 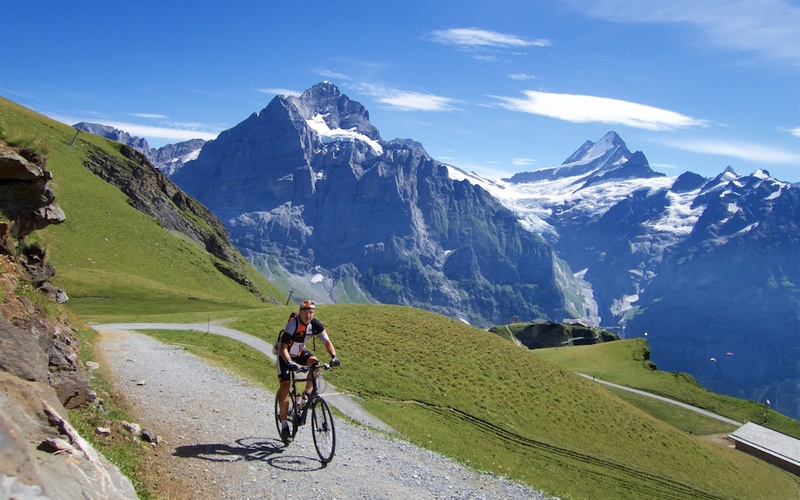 The gravel route above Krimml waterfall of Austria is also one of my favorite. 4. 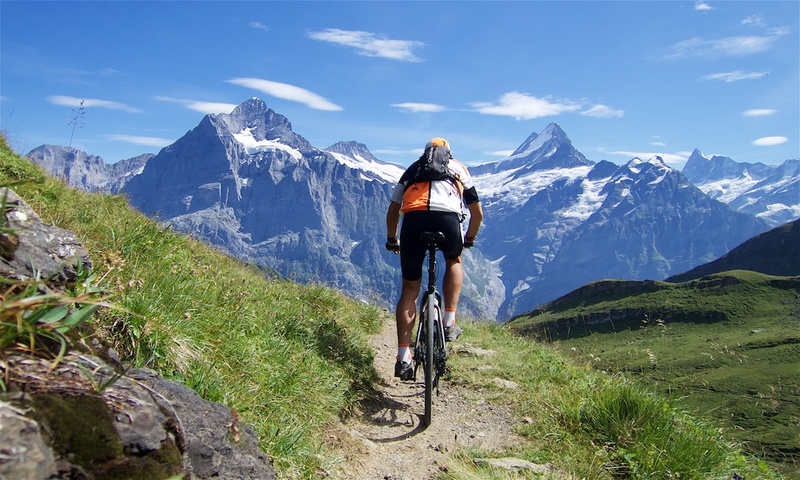 Great web site with lots of information to help cyclists to plan their own trips. Thanks! Fantastic! Super cool! I am going next week. What time of the day do you recommend starting off? I don’t think it matters. Cooler and quieter early?